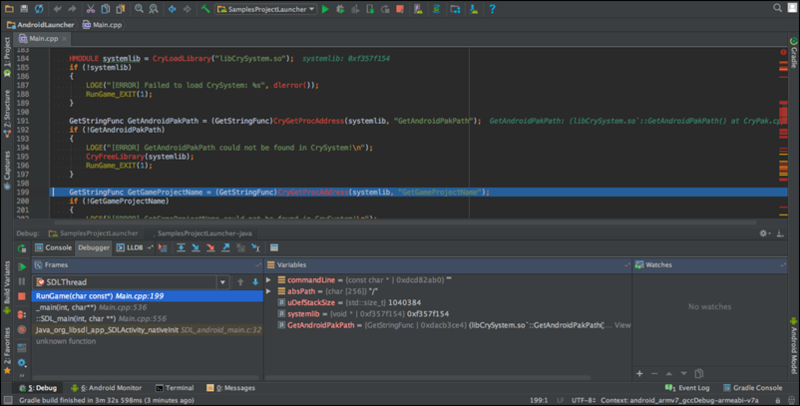 After your Lumberyard project is imported, you can build and debug it using Android Studio. In Android Studio, select a game project to debug from the target list in the menu bar. The prepopulated list of targets vary depending on the Android Studio version. For Stable versions of Android Studio 2.1.x, select the target with the -native suffix in order to debug native code. Set your native break points. In Android Studio, click Debug target. In the Select Deployment Target dialog box, select your device and click OK.
Lumberyard does not support Android emulators. If you do not see your physical device, click Cancel and run adb kill-server in the terminal pane in Android Studio. Then attempt another run/debug build. Android Studio will build the project, launch the application, and connect to the debugger. Click Make project to build all targets in the project, minus the APK packaging step. Click Select target to run the selected game project (if multiple game projects are enabled). Click Run target to run the selected game project with application-specific monitoring on the Android Monitor tab. Click Debug target to run the selected game project with the Android Studio debugger attached.